A look at what’s new from Cisco, Slack, 8x8, Polycom and Dialpad. In this week's No Jitter Roll, we look at announcements about enterprise communications topics like team collaboration, UC, contact center and video, as well as acquisition and funding news, from Cisco, Slack, 8x8, Polycom, and Dialpad. Cisco this week published a couple of blogs detailing enhancements to Webex Meetings and Webex Events. The two products will be getting a new look and feel starting July 27, Javed Khan, VP and GM of Cloud Collaboration Technology at Cisco, wrote in a Cisco Blogs post. Cisco is also introducing new capabilities and a faster way to join meetings. It's also rolling out a new desktop app that replaces Webex Productivity Tools. The new capabilities include an updated view in video meetings that uses the whole screen's real estate, Khan explained in his post. Additionally, Cisco has introduced new layouts, and is allowing users to control how they view video participants and content -- for example, a side-by-side view of content and video participants versus the ability to toggle back and forth between the two views. Cisco has also added a centralized control bar, shown below, where users can find all the meeting controls to do things like customize their view or share content. The new desktop app features a "pre-meeting experience" screen with integrated scheduling and calendar management, now matching the capabilities of the Webex Meetings mobile app. Pulling data from calendars like Microsoft Outlook and Google Calendar, as well as from the Webex Meetings database, the Webex Meetings tab displays a user's upcoming meetings for the day or week ahead. Additionally, users have quick access to join meetings directly from the meeting listing. These enhancements to Webex Meetings and Events follow on user interface and search tweaks the company made to Webex Teams last month. "Design is one of those things where, if it's done well, it seems like it's very easy," said Torkel Mellingen, VP of The Design Group in the Cisco Collaboration business, in an interview published in a Cisco Blogs post. "The reality is, redesigning a product like this is more like solving a puzzle that has more pieces than space. Which of course is why it's so fun and challenging." In other collaboration news, Slack announced this week that it's acquiring Robots & Pencils' Missions, which is a tool for automating routing processes and tasks. The tool is aimed at helping non-developers build custom integrations, the company explained in an Official Slack Blog post. "We'll be building on the Missions technology to enable those charged with increasing their team's productivity -- from marketing and sales ops to business analysts -- to automate routine work, without ever having to write code," the post stated. "By streamlining these common tasks, your team is freed up to do more creative and strategic work." Example use cases for the Missions technology include streamlining new employee onboarding by guiding them through documents they need to sign and people they should meet. 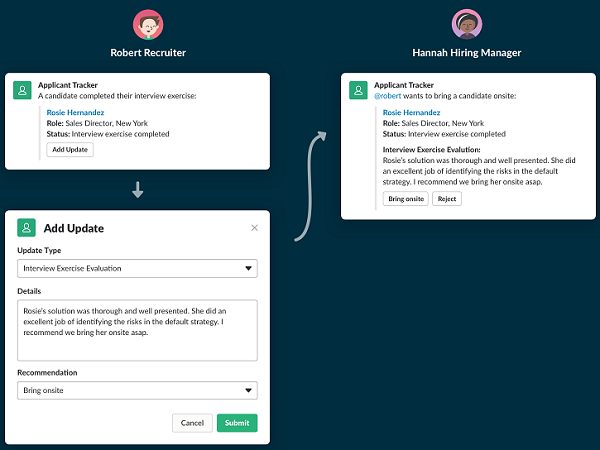 Other example use cases include building a simple internal ticketing workflow and managing job candidate approvals and rejections between recruiting and hiring managers, as shown below. Slack will be integrating Missions technology into the platform over the next few months. During that time, Slack will continue to support existing Missions customers at no cost, the company said. 8x8's X Series, a cloud communications platform aimed at breaking down the distinctions between the enterprise and contact center, is now generally available in the U.S. and U.K., the company announced earlier this week. shared with No Jitter at the time of the platform's introduction in March. As he described then, 8x8 is offering eight service plans for the platform, aptly named X1 through X8. Enterprises can pick the version that best meets their needs, whether that's simple cloud telephony, team collaboration, or a fully loaded contact center. Flynn Restaurant Group, a restaurant franchise operator with more than 460 Applebee's in 23 states, is one of 8x8's early X Series customers. The company turned to 8x8 when it sought to modernize its legacy communications infrastructure so it could better support interactions between employees and customers, said Jeffery Kent, SVP of IT at Flynn Restaurant Group, in a prepared statement. "With X Series," he said, "we will finally have strong analytics and reporting capabilities across all locations to quickly identify trends and improve our employee and customer engagement." 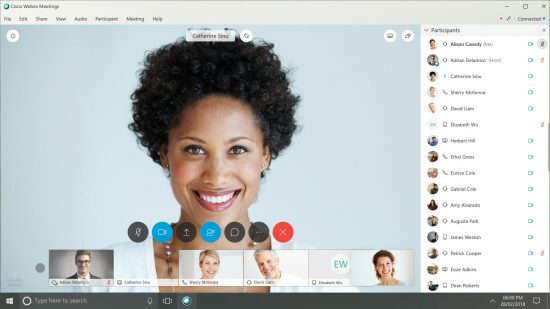 Polycom, now part of Plantronics, announced at the Microsoft Inspire event this week that its RealConnect Service, Polycom Trio, and Polycom MSR Skype Room System now support Microsoft Teams. RealConnect, previously available for users of Skype for Business on-premises and online, now allows standards-based endpoints like Polycom and Cisco to join Microsoft Teams meetings. Customers can port their RealConnect licenses for Skype to Business to a Teams environment, Polycom said. Polycom Trio now supports Teams for meetings and calls by running the native Teams application for phones. Polycom MSR, which is the company's Skype Room System, now supports Microsoft Teams video meetings. Both RealConnect for Microsoft Teams and Trio for Teams will be available in 3Q18. Polycom has launched a Teams beta program with roughly 50 enterprise customers to gather feedback on performance and reliability prior to release. "Polycom is going 'all in' to create the best Microsoft Teams experiences across a full and growing range of communications devices and solutions, and something I see expanding to the full Plantronics family of solutions," said Plantronics president and CEO Joe Burton, in a prepared statement. Cloud communications provider Dialpad announced this week that it's raised $50 million in a Series D funding round led by ICONIQ Capital, bringing Dialpad's total funding to $120 million. Existing investors Andreessen Horowitz, Amasia, Scale Venture Partners, Section 32, and Work-Bench also participated in this latest round. Will Griffith of ICONIQ Capital will join the Dialpad Board of Directors. The new funding will be used to accelerate momentum for Dialpad's real-time artificial intelligence (AI) technology that it gained with its TalkIQ acquisition in mid-May, which resulted in a voice intelligence capability called VoiceAI that the company is currently integrating into its product portfolio. Specifically, Dialpad will use the cash to strengthen its VoiceAI-powered call center products for sales and support organizations, develop real-time coaching and playbooks for frontline teams, and fortify overall go-to-market strategy, Dialpad said. Dialpad "absolutely" sees AI as a core of its business moving forward, CEO and founder Craig Walker told me in a briefing. "We decided to just include [VoiceAI] in all existing SKUs, and we're not even going to charge more for it. ... Since we're going so big on this, it's a core piece of everything we do," he said. Dialpad will also use the new funding to hire salespeople to take VoiceAI to market, Walker added. "The funding is mostly for go-to-market and AI," he said. "But we're also investing in international expansion in Tokyo and Europe." Dialpad's last funding round prior to this was in September 2017, and since then, it has added roughly 10,000 new customers and doubled its annual recurring revenue, the company said. In 2018, Dialpad plans to grow its headcount by 50%, and in 2019, Dialpad intends to expand its EMEA footprint. No Jitter Editor Beth Schultz contributed to this post.